1 For the broccoli and cucumber soup: Peel the cucumber and the broccoli stalk. Boil the cucumber skin in a little salted water until the water is green, then set aside and leave to cool. 2 Finely dice the broccoli. Peel the garlic and sweat in oil with the broccoli. Add just enough water to cover the bottom of the pan along with the stock granules and cook for about 10 minutes, until soft. 3 Drain through a sieve. Halve the cucumber lengthwise, remove the seeds and finely dice 1-2 cm of cucumber. Reserve for the garnish and roughly chop the rest. 4 Take the cucumber skin out of the liquid, put the green water into a liquidiser with the chopped cucumber and cooked broccoli and blend well, until the mixture is an even, pale green puree. Season to taste with salt and pepper and then chill. 5 For the pumpkin sou: Finely dice the pumpkin flesh. Score the chilli on all sides. 6 Heat the oil in a small pan and sweat the pumpkin flesh for a few minutes. Add the stock and bring to the boil. Then reduce the temperature, add the chilli and cook, covered, for about 15 minutes until soft. 7 Season to taste with salt, pepper and nutmeg. Remove the chilli. Reserve 1-2 tbsp pumpkin flesh and puree the rest very finely. Leave to cool and then chill. 8 For the garnish, mix the reserved pumpkin flesh with the diced cucumber. Finely dice the prawns and the scallop and mix with the diced vegetables. Season with salt and pepper. 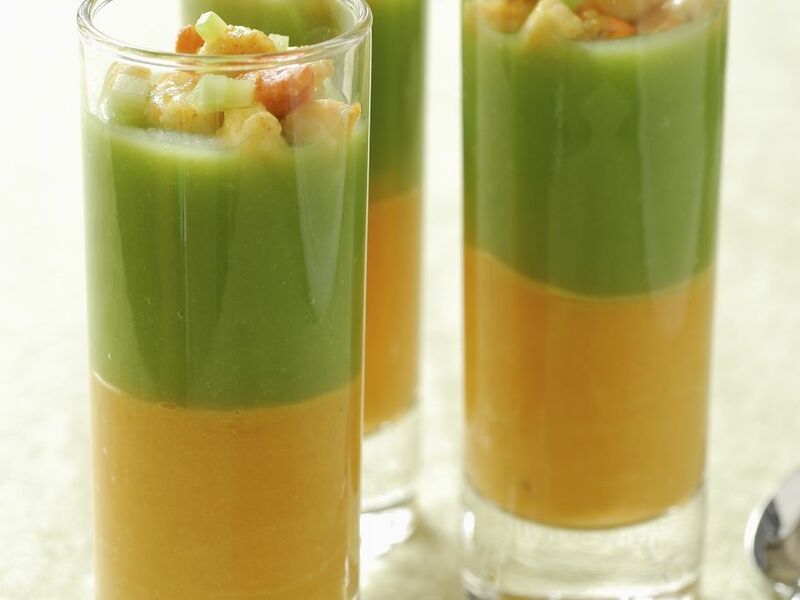 9 Half-fill 4 tall shot glasses with cold pumpkin soup. Carefully pour the broccoli and cucumber soup over a spoon on to the pumpkin soup, so that the two layers do not mix! 10 Place a little of the garnish mixture on top of each serving of soup and serve immediately. Serve with fresh white bread.